Mikel Landa attacked Alberto Contador on the Colle delle Finestre and got a good gap, before other riders made the same thing and let the race leader behind. Eventually, Contador cracked, which allowed Landa to put 1:40 to his countryman in the valley before Sestriere. At the front, a group containing Fabio Aru, Ryder Hesjedal, Steven Kruijswijk and Rigoberto Uran rejoined Landa and Ilnur Zakarin, who was part of the early escape. Back in the Astana team car, Giuseppe Martinelli told Mikel Landa to pull hard for Aru, which the Basque rider did, and this finally led to an impressive attack of the white jersey wearer, that brought him the second stage win in a row. Alberto Contador finished more than two minutes behind, but still has a comfortable cushion and is sure of winning the Giro d’Italia seven years after his first victory. Here it is, the final day of the race, a flat one for the fast men of the peloton, who’ll get another shot at glory. Starting from Torino, the 185-km long route rolls through the Po Valley along entirely flat roads, and reaches Milan, connecting the cities that served (Torino) and serve (Milan) as headquarters for the Gazzetta dello Sport throughout history. The stage course covers wide and mainly straight roads, with just a few city-centre crossings, with roundabouts, speed bumps and traffic islands being the main, “typical” obstacles. 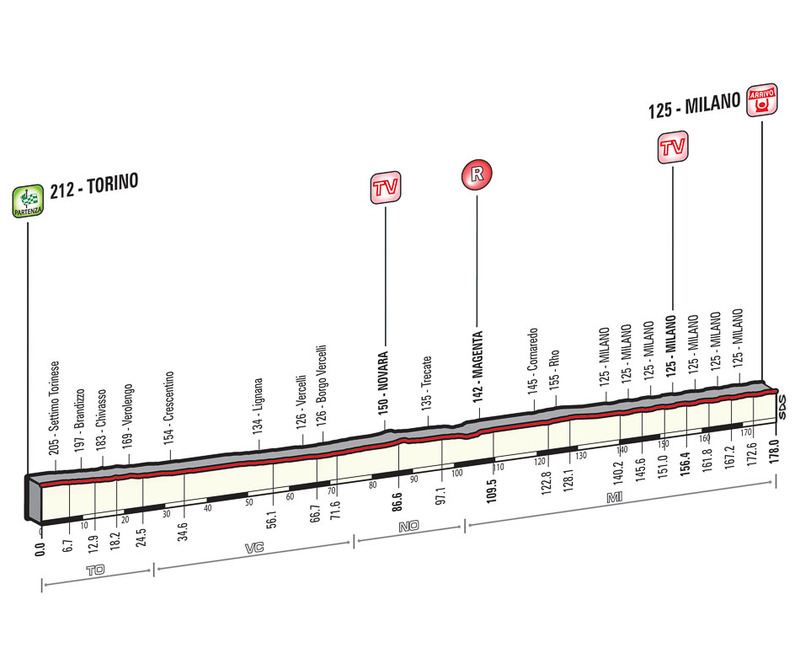 The route arrives in Milano through Pero and the Expo site, and it enters the final circuit, to be covered seven times, and finishing in Corso Sempione. The circuit is 5350-m long and stretches along wide, well-paved avenues around the Vigorelli velodrome and the Fiera Milano City fairground. It features eight bends and four half-bends, and it crosses a tram-line twice (vertically). The home straight is 1-kilometer long, on 8,5-m wide asphalt road. First in the red jersey classification, with a 17-point advantage over Sacha Modolo, Giacomo Nizzolo can cap it off in style, by taking not only the jersey, but also the stage victory, his first in a Grand Tour. But it won’t be easy for the 26-year-old, as Sacha Modolo and Elia Viviani will be in the mix at Milan, where also Luka Mezgec will try to go out with a bang, just as he did in 2014, when he scored a big victory in Trieste. The Corsa Rosa returns to Milan for the last stage three years after Marco Pinotti took the victory in the time trial that run over the cities streets, while Ryder Hesjedal became the first Canadian winner of a Grand Tour. Last time the Giro d’Italia finished here with a stage in line, Alessandro Petacchi finished first, but was subsequently disqualified and the victory went to Argentina’s Maximiliano Richeze. It was a mammoth day, won in the end by Fabio Aru, the best young rider in the race, who surged clear from the pink jersey group with around seven kilometers to go and catched Ryder Hesjedal, before leaving the 2012 champion behind and ploughing on to the finish line on Cervinia. The 24-year old scored his fourth Grand Tour victory and climbed to second in the overall classification, 38 seconds clear of Mikel Landa, his Astana teammate, who came in the same group as Alberto Contador. The Spaniard from Tinkoff-Saxo retained the maglia rosa, who now he’ll wear for the 21st day in his career, with just two stages left until the end. This high mountain stage (Saint-Vincent-Sestriere, 199 kilometers) features the last summit finish of this year’s Giro. The first 150 kilometers run across the whole upper Po Valley, and serve as warm up towards the Colle delle Finestre climb. The route rolls through the Canavese area via Ivrea and Rivarolo Canavese, it rolls past Venaria Reale and reaches the Susa Valley, before hitting Colle delle Finestre, which is Cima Coppi (the title given to the highest peak in the Giro d’Italia) in 2015. Colle delle Finestre has an elevation of 2178 meters and was already climbed (with its non-asphalted sector) in 2005 and in 2011. The winner of the stage featuring the Cima Coppi will be awarded the “Trofeo Torriani”, in memory of the legendary race director, who reigned between 1949 and 1993. Colle delle Finestre (18,5 kilometers) climb features a steady 9,2% gradient, from foot to summit (with just a short spurt in Meana di Susa with a maximum 14% slope). The road is paved over the first 9 kilometers, while the remaining 9 kilometers run on dirt road, up to the summit. The first part of the ascent features as many as 29 hairpin turns in less than 4 kilometers (totalling 45 hairpins up to the crest). In the first part (up to Pian dell’Alpe), the descent is technical, narrow and not protected. As the stage course goes back to ss. 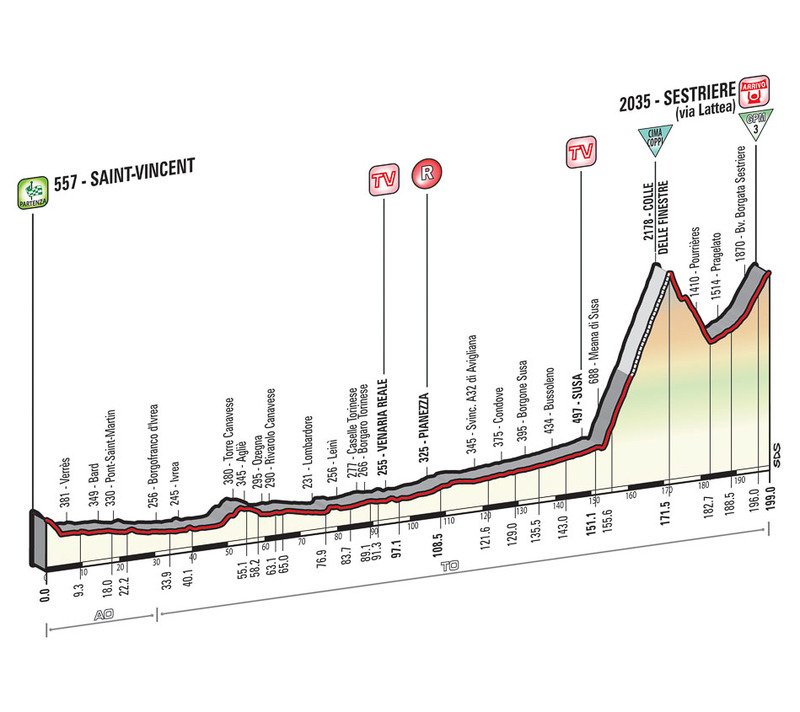 23, the climb of Sestriere (9,2 kilometers, average gradient 5,4%) ramps up again, with affordable slopes, up to the finish. The last kilometers run along the ss. 23, with wide and well-paved roadway, with just a small roundabout 500 meters from the finish. The 400-m long home straight is on 6.5-m wide asphalt road. Mikel Landa lies third in the overall standings, but he’ll look to climb back to second at Sestriere, where it all depends on the strategy of Astana and Fabio Aru’s legs, who seems to be going better and is very motivated to finish one place higher than he did last year. Landa can’t attack his teammate – whose resurgence could continue on Saturday – so his best hope is an acceleration of Alberto Contador, whom he can follow without being too concerned about Aru, in case the Italian has another bad moment. Mikel Nieve, Ryder Hesjedal, Rigoberto Uran and Steven Kruijswijk can also be contenders, but for this they need a status quo among the main favorites, which isn’t very likely. Kruijswijk will also want to win the mountains classification, but it won’t be an easy task for the LottoNL-Jumbo, as Movistar can play two cards for this, Beñat Intxausti and Giovanni Visconti, who wears the blue jersey after Cervinia. Sestriere will host a Giro d’Italia finish for the seventh time, and for the first time since 2011. Previous winners here are Eduardo Chozas (1991), Miguel Indurain (1993), Pascal Richard (1994), Jan Hruska (2000), Jose Rujano (2005) and Vasil Kiryienka (2011). The most famous winner is Indurain, but the most spectacular stage was the one of 2005, when Paolo Savoldelli, Gilberto Simoni, Jose Rujano and Danilo Di Luca where the protagonists of one of the best fights the race has ever witnessed. Philippe Gilbert became the first Belgian rider since Roger De Vlaeminck, in 1979, to take multiple stage wins in one edition of the Giro d’Italia, after attacking from the breakaway and soloing to the win in Verbania. On the Monte Ologno – the only climb of the day – Alberto Contador went clear after getting notice that Mikel Landa was involved in a crash and was two minutes behind. The Basque rider took back more than one minute, but once he returned to the Fabio Aru group he stopped, as another attack meant that his teammate would have risked losing the third place to Movistar’s Andrey Amador. As a result, Contador increased the gap in the general classification, more than five minutes being at the moment behind him and his Astana rival. This queen-stage (Gravelona Toce-Cervinia, 236 kilometers) throughout the Alps features a total difference in altitude of approximately 4800 meters, that is covered almost entirely over the last 100 kilometers, with three subsequent climbs, measuring up to almost 20 kilometers each. The route winds its long journey around the Alpine foothills through the districts of Borgomanero and Biella, and then it enters the Aosta Valley, where the last 150 kilometers of the day will roll out. The stage course tackles the St. Barthélemy ascent (16,5 kilometers at a 6,7% gradient), St. Pantaléon (16,5 kilometers at a 7,2% gradient) and, eventually, it ramps up the Cervinia climb (19,2 kilometers at a 5% gradient). The last kilometers run entirely uphill. The route rises with the steepest slope just before, and while crossing, the town of Valtournenche. The climb starts to level out gently three kilometers before the finish. With less than 2000 meters remaining to go, the average gradient is 1,4%. The 450-m long home straight, on 7-m wide asphalt road, has a 4% gradient. Over the last six kilometers, the stage course features two well-lighted tunnels. The headline of this stage should be the duel between Alberto Contador and Mikel Landa. The 32-year-old Spaniard is still in the hunt for his first ever Giro d’Italia stage and the Cervinia stage will provide him with the second-to-last opportunity to reach this goal, while his fellow countryman will hope to take his third victory at the race and increase his value for the upcoming transfer period, when many World Tour teams will be ready to fight for his signature. Steven Kruijswijk and Ryder Hesjedal – who have hit top form in the last week of the Corsa Rosa – are two other strong contenders for the win, with the Dutchman being also interested in the blue jersey, which he wants to take home. If an escape will succeed, then look for cyclists like Franco Pellizotti, Carlos Betancur, Stefano Pirazzi, Igor Anton, Darwin Atapuma, Mikel Nieve and Rigoberto Uran, who all hope to get something from the race. Cervinia will be a stage finish for the fourth time in 98 runnings of the Giro d’Italia, and will return to the race three years after witnessing an historic moment, the first Costa Rican victory in a Grand Tour. In 2012, from a breakaway that got a big gap at the start of the day, Andrey Amador outsprinted Jan Barta and scored his biggest win to date. Lampre-Merida confirmed once again that is the most powerful team in the sprints, guiding Sacha Modolo to another win, his second in the space of a week, after the one in Lido di Jesolo. Giacomo Nizzolo came runner-up, ahead of Luka Mezgec, and posted his 9th podium in a Giro d’Italia stage. Still, there was something to be happy about for the cyclist of Trek Factory Racing, as he took the red jersey from Elia Viviani (who came 11th in Lugano), and now has a huge chance to win it in Milan, on Sunday. 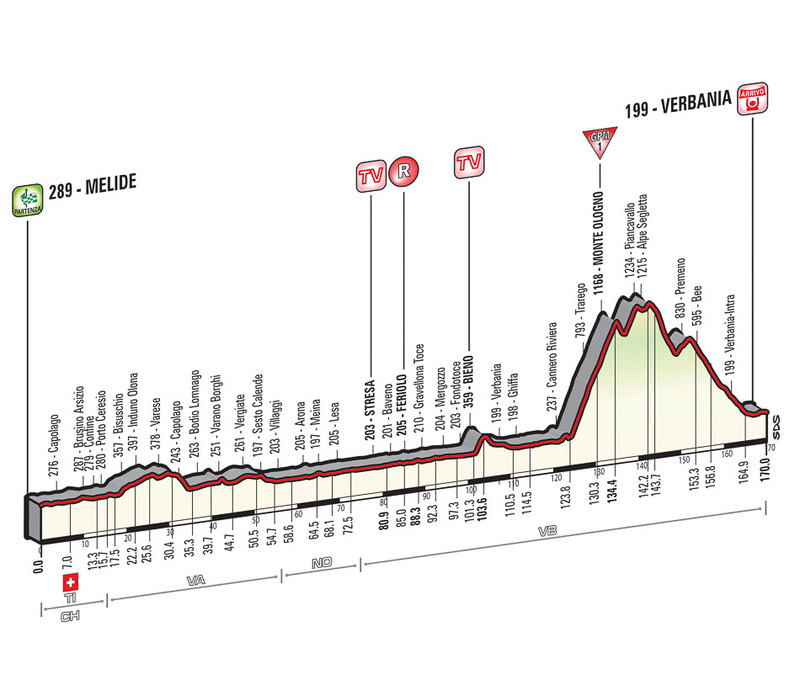 The stage between Melide and Verbania (170 kilometers) is clearly divided into two parts. The first, flat 125 kilometers run from Melide, along the shores of Lago di Lugano, lead back to Italy and roll across Varese and Sesto, to reach Lago Maggiore. The route skirts around the lake through Arona and Stresa, reaching Mergozzo and Verbania (first time), brushing very close by the finish line. Watch out for a number of obstacles, such as roundabouts, speed bumps and traffic dividers, while crossing urban areas. The route rolls past Verbania and gets to the Monte Ologno ascent that features steep gradients (average slope 9%, maximum slope 13%). The first part of the descent is curvy and technical, but with low gradients. As the stage course reaches Alpe Segletta, the second part is wider and easier. The descent ends 5 kilometers from the finish. The last 17 kilometers run along a wide, well-paved downhill road leading from Premeno to Verbania (a former railway with slopes of approximately 5%), up to 5 kilometers from the finish in the built-up area of Verbania. The route rolls past a few roundabouts and traffic dividers, and eventually reaches the waterfront. The last 3,5 kilometers are quite uncomplicated and the finish line lies on a 200-m long straight, on 6,5-m wide asphalt road. This is a big opportunity for a breakaway, so many riders have the 18th stage marked in their agenda since a while ago. Giovanni Visconti, Ilnur Zakarin, Carlos Betancur, Franco Pellizotti, Fabio Felline, Damiano Cunego, Tanel Kangert and Darwin Atapuma are some of the usual suspects that can mix along, hoping to put a big gap between them and the peloton, before trying to dispatch everyone else in an attempt to score an important victory. In the pack, it will be interesting to see how Astana will fare now that Mikel Landa lies in second place and has showed that he is the most strongest rider of the team. More than sure, the Kazakh squad will forge at the front and try to isolate Alberto Contador, and then attack him. Basically, Astana will have three goals in the mountains this week: keep both Mikel Landa and Fabio Aru on the podium, score at least one more win and get Contador tired before the Tour de France. The race will return to Verbania for the first time in 23 years. In 1992, the fight for the victory was an Italian affair, with Franco Chioccioli first, ahead of Claudio Chiappucci and Massimiliano Lelli. In the overall standings, Miguel Indurain kept his pink jersey, which he took to Milan, where he became the first Spanish rider to win the Corsa Rosa. It was yet another crazy and action-packed stage at the Corsa Rosa, sticking to the pattern of the previous two weeks. The race exploded when Alberto Contador had a mechanical problem on a descent right before Mortirolo, which made Katusha and Astana push hard at the front in order to distance the pink jersey. This doesn’t stopped the 32-year-old from coming back almost on his own, after an impressive ascent of the Mortirolo (45:07), where he also took advantage of the fact that Mikel Landa had to wait for Fabio Aru more than once, as the Italian had problems. Eventually, the Basque cyclist got a “carte blanche” from Astana after Contador attacked and the two of them, joined by Steven Kruijswijk, surged at the front. On the final ascent of the day, Landa – who’s out of contract at the end of the season – attacked and soloed to take the win, thus climbing to second in the overall classification (4:02 behind Contador) and becoming only the second rider victorious on Madonna di Campiglio and Aprica, after Marco Pantani. 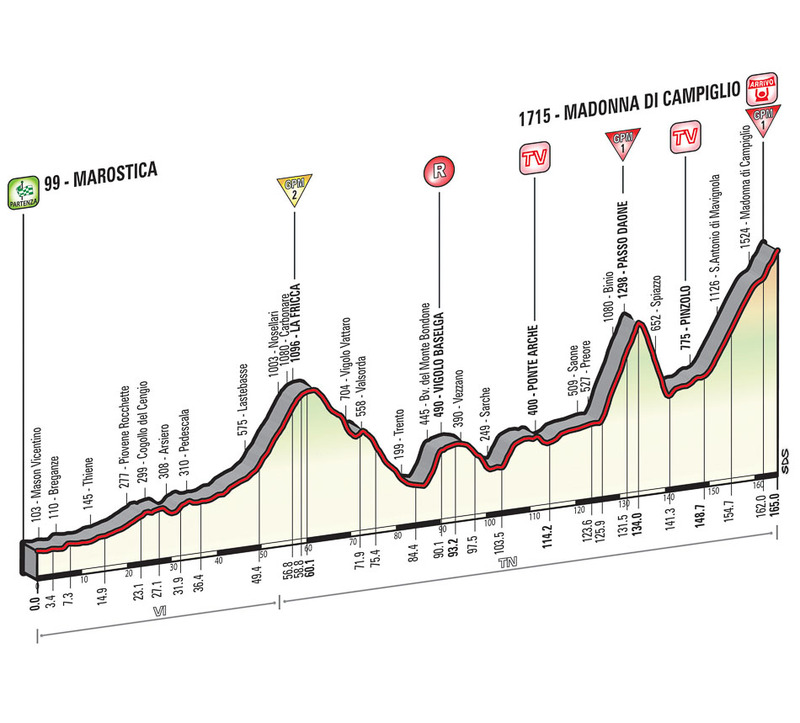 This stage (Tirano-Lugano, 134 kilometers) will partly allow the riders to regain their strength. It is most suitable to sprinters, but it is not completely flat. The only categorized climb of the stage is just after the start, with the Teglio ascent (7,4 kilometers, 6,5% average gradient). The Valtellina scenic route runs across Poggiridenti and leads to Sondrio. 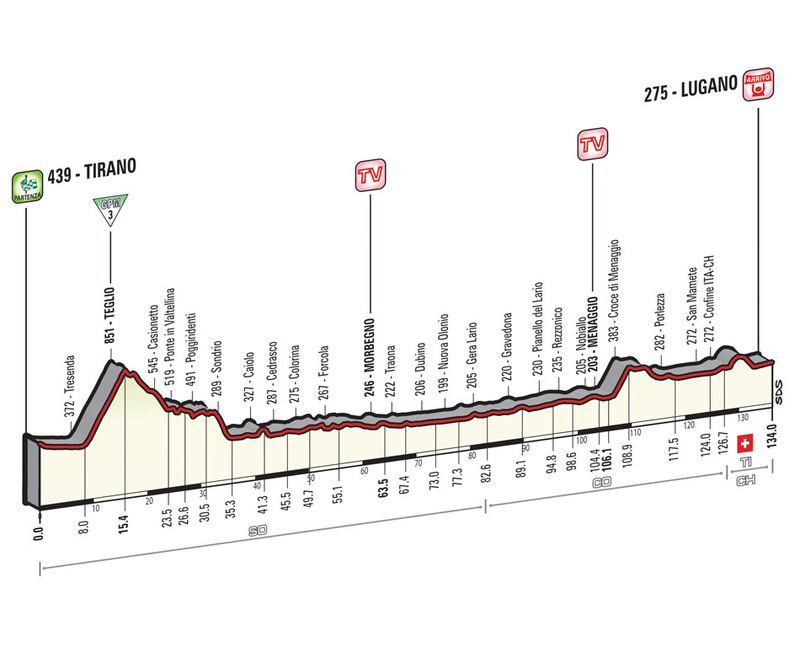 Here, the stage course enters the Adda River valley, and runs along it until it reaches the mouth of Lake Como. The roadway narrows all along the lakefront road leading to the short Croce di Menaggio climb. The following stretch of road leading to Lake Como has a few tunnels along the route. The last three kilometers run across the urban area of Lugano. Watch out for a number of obstacles, such as roundabouts, speed bumps and traffic dividers, while crossing urban areas. The finish runs initially downhill (with two close hairpin bends three kilometers before the line), then along the shores of Lake Lugano, on well-paved roads. The route features one last bend, 750 meters from the finish, on 7-m wide asphalt road. 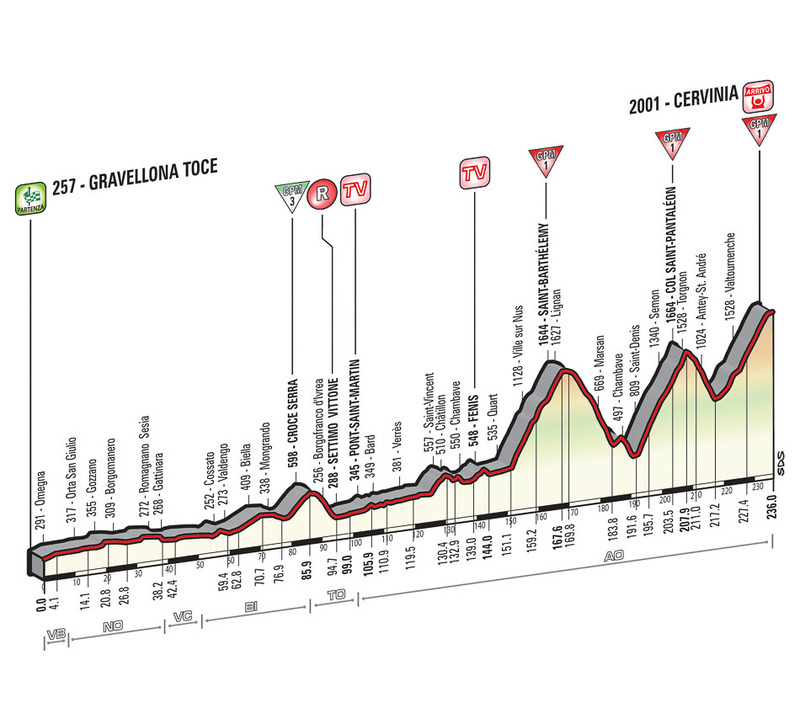 After the damages made by Mortirolo, the weather and the fast pace of stage 16, a breakaway – which can include Marco Bandiera, Silvan Dillier, Simon Geschke, Sonny Colbrelli, Ion Izagirre, Sylvain Chavanel or Luis Leon Sanchez – has a strong chance of going all the way to the line, especially as the peloton can break on the Teglio. If this won’t be the case and the peloton gets to control the escape, then the sprinters will get to fight at the finish for the first time in a week. Sacha Modolo, Elia Viviani and Giacomo Nizzolo are the top three favorites, the last two being interested not only in a win, but also in the red jersey classification. Lugano returns in the Giro d’Italia for the third time in history. The previous visit here took place in 1998, when the Swiss city acted as finish for a 34-km long individual time trial, scheduled on the penultimate stage of the race. Riding for Cantina Tolo, Serhiy Honchar won on that day and was followed on the podium by Massimo Podenzana and Marco Pantani. Mikel Landa landed his first career win in a Grand Tour, after catching Yuri Trofimov and leaving him behind with 600 meters to go on Madonna di Campiglio, where the Corsa Rosa returned after 16 years. Alberto Contador rounded out the podium, with Fabio Aru fourth, the young Sardinian again showing some weaknesses that now leave him trailing the Spaniard by 2:35. If Contador’s maglia rosa seems out of reach, it will be interesting to see if Aru can return to his best in the last week or if Landa will get more freedom from Astana to fight for the podium. Besides the two of them, other riders in contention for a top 3 finish are Andrey Amador, Leopold König, Yuri Trofimov and Damiano Caruso. This is a high mountain stage with as many as five categorized climbs and a total difference in altitude of 4500 meters. 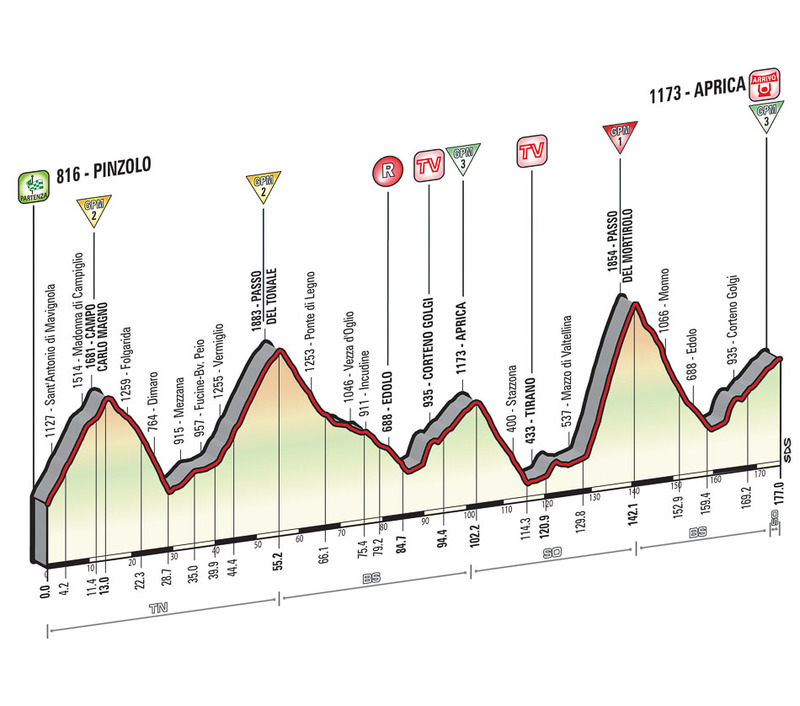 The route starts uphill in Pinzolo, clears the Campo Carlo Magno climb (this is largely the same ascent as the previous stage), takes a fast-running descent into Dimaro and goes up again, towards Passo del Tonale (15,3 kilometers at a 6,1% average gradient). The stage course drops down into Ponte di Legno and Edolo, then takes in the first climb towards Aprica, through the village of Santicolo (with gradients of roughly 15% in the first stretch). After rolling past Corteno Golgi, the route takes the ss. 39 and heads for the first passage on the finish line. The following descent is initially wide and fast, and turns narrower and more technical all the way up to Stazzona. The route levels out briefly while running through Tirano (the only flat sector of the stage), then it tackles the Mortirolo climb (10,9 kilometers, 10,9% average gradient and 18% maximum gradient) along the traditional Mazzo di Valtellina slope. The Mortirolo Pass will be this year’s “Montagna Pantani”, recalling the great success of June 4, 1994, when Pantani clinched a masterful solo win – his second consecutive stage win, from Merano to Aprica – attracting the whole cycling world’s attention and claiming the podium for that year’s Giro, behind Russia’s Evgeni Berzin. Mortirolo is followed by a technical descent (on narrowed roadway in the first part), leading to Monno and then to Edolo, where the route will cover once again the 14 kilometers leading to Aprica. The road runs entirely uphill, with remarkable gradients between Edolo and Santicolo (max. 15%), but flattens out gradually while approaching the finish, dropping to 5% with 5 kilometers to go, and to less than 2% over the last 500 meters. The finish line lies on a 7,5-m wide asphalt road, running gently uphill. We can have two fights on this stage: one is for the stage win, which can be decided from a breakaway that can include Carlos Betancur, Mikel Nieve, Beñat Intxausti, Stefano Pirazzi, Davide Formolo, Darwin Atapuma, Igor Anton, Sylwester Szmyd, Esteban Chaves and Przemyslav Niemiec, many of these being interested also in the blue jersey, which lies on the shoulders of Intxausti. The second fight of the day concerns the GC cyclists, with Alberto Contador in the spotlight. The rider of Tinkoff-Saxo said that he wants a stage victory, but not with the price of spending a lot of energy for it, but this doesn’t mean he can’t attack on the Mortirolo in order to force a selection. On the other hand, after seeing that whatever they do he can’t lose the pink jersey, Astana can try to push it hard on the climbs to isolate and tire Contador ahead of the Tour de France, where he’ll meet Vincenzo Nibali. Besides them and the other cyclists in the top 10, pay attention to Steven Kruijswijk, who looks close to top form, which can help him make an important jump in the overall classification. Aprica has hosted eight stage finishes throughout the years, with the first taking place more than half a century ago. The riders who have won in the Lombardy ski resort are Vittorio Adorni (1962), Leonardo Sierra (1990), Franco Chioccioli (1991), Marco Pantani (1994), Ivan Gotti (1996), Roberto Heras (1999), Ivan Basso (2006) and Michele Scarponi (2010). He came, he saw, he conquered. Ok, maybe not yet, because the Giro d’Italia always is a hectic and crazy affair, but Alberto Contador is very close of winning the Trofeo Senza Fine for the second time in his career, after the 2008 edition, when he came at the start at the last minute and went on to take a hard fought victory. Although he crashed and lost time (as well as the pink jersey) in stage 13, the Spaniard returned at the top one day later in commanding fashion, after what can be described as a very impressive display of power in the individual time trial between Treviso and Valdobbiadene, where all his rivals where put in a striking distance and let to nurse their ego and thus change their objective, after seeing that Contador is out of reach at the moment. Not only that the Tinkoff-Saxo rider has a great physical level, he is also rock solid when it comes to his confidence, which allows him to land one psychological blow at a time to his opponents. In that matter, he goes for bonifications at intermediate sprints and at the finish, or starts playing with them on the climbs, attacking before slowing the tempo and going at it again, thus reminding everyone of his 2011 form, when he won the Giro with an incredible ease, by more than six minutes (before being stripped of that victory). It’s true that the hardest week of the race is yet to come – with Aprica, Cervinia and Sestriere on the menu – but what’s frightening for the likes of Fabio Aru and Astana is that Alberto Contador keeps getting better and stronger. On Madonna di Campiglio, although he said that he wants to win in honor of Marco Pantani, the 32-year-old didn’t feel like chasing when Mikel Landa attacked and preferred to keep his forces, but this won’t happen on the next summit finishes, as he wants to cap off what has been an impressive and dominant ride so far with a stage win. As it goes at the moment, Contador will have no problem in taking the overall win in Milan, which will make him the main favorite for the upcoming Tour de France, even though Chris Froome, Vincenzo Nibali and Nairo Quintana will be there. Then, later in the season, if he will be victorious also in the Grande Boucle, you can bet on the fact that he’ll line-up at the start of the Vuelta a España, where he’ll be looking for a memorable treble.